I have to thank Poshmark for encouraging me by having me co-host an amazing party next week and to do some serious spring cleaning. It has been a long time and this weekend, I plan to tackle my overwhelming closet! The great news? I will be selling some of my favorite shoes and clothes on Poshmark , including my very own pumps that inspired the "Studs" part of my blog name right here. 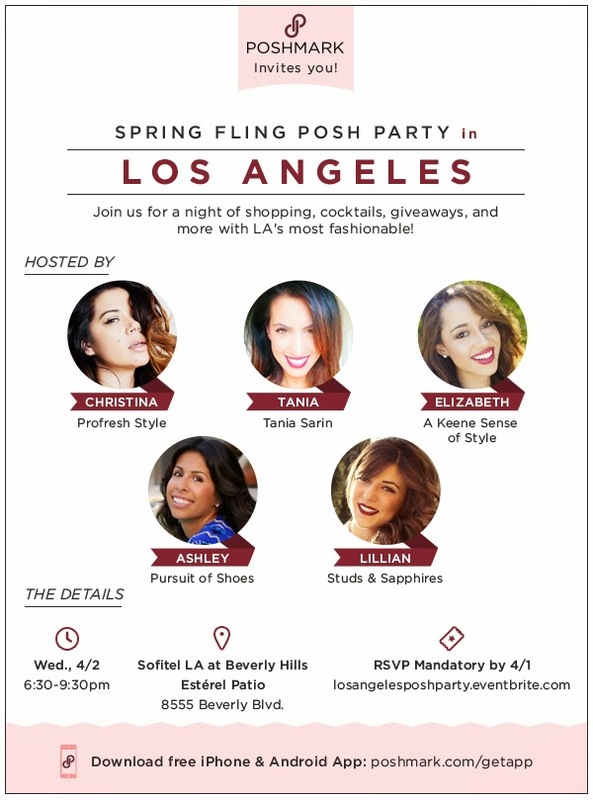 If you live in LA, please join our "Spring Fling" themed party with a night of cocktails, mingling and shopping! I would love to see all of you at the event - please RSVP here and by 4/1! If you can't make it or don't live in LA (don't worry), you can still enjoy the fun from your iPhone or iPad. Just make sure to download the Poshmark app and you can shop our closets virtually or share your own "Spring Fling" items for sale! I hope to see you all there or on the app! P.S. Use code "BNAGB" to get a $5 shopping credit when your register. YAY! Love those pumps you are selling- I have them too and you inspired me to possibly list them. Out with the old, in with the new right?! Can't wait to meet you and Posh Party it up!! So excited to see you at the Posh Party! Thanks for hosting (and can't wait to see what else you list! ).